Eames Hang-It-All | Herman Miller Accessories | Herman Miller Furniture (India) Pvt Ltd.
With their Hang-It-All, Charles and Ray Eames elevated the everyday coat rack into something inventive and fun. First crafted with multicolored hooks and a white wire frame, new options expand the offering, all with fidelity to the sophistication and sense of play of the original. Originally designed for children, the Hang-It-All is now considered at home in places where adults work and play, too. Although it's fun, it's practical, too. Strong enough to hold winter overcoats, laptop case, or messenger bag, it's a cheerful piece that can brighten up a foyer, mud room, bedroom, kitchen, or bathroom. "The appreciation of the small objects that are around us every day is what produces an appreciation of art." To create the rackâ€™s wire frame, Charles and Ray and the Eames Office applied the mass-production techniques for welding wires they had developed for earlier designs. The frame has a durable powder coat finish, and each of its angular bends is capped with solid wood spheres. 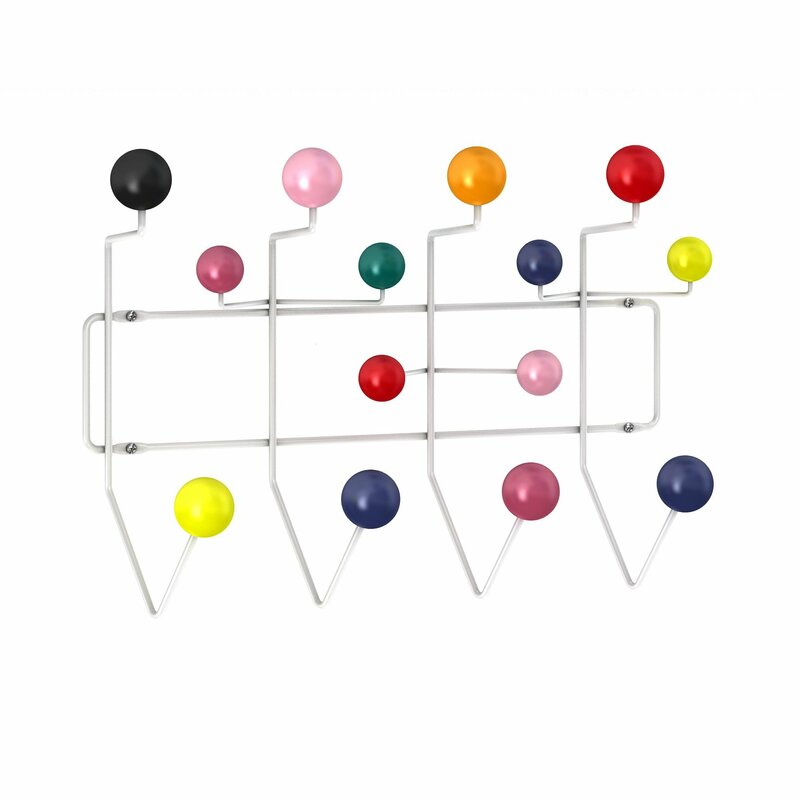 The Eames Hang-It-All first appeared in 1953 as storage for childrens belongings. Today, the whimsy established by the Hang-It-All in childrenâ€™s room dÃ©cor carries through to an artful foyer or entryway statement. For secure mounting, drywall anchors and screws are included. In the early 1950s, the prolific Charles and Ray Eames design team focused much of their energy on design projects other than furniture. They exercised their graphic design muscles with new ads and brochures for Herman Millerâ€”advertising their own molded plastic chairs. They made several films, including one called "Parade," a live-action film in which the characters were all toysâ€”lead soldiers, puppets, cars, dolls. There also was "Bread," a film that Charles described as being about "the way bread is used in nutrition, bread as art, bread as a political tool, bread as a symbol." During this period, they also made several sophisticated card games, elaborate cardboard and paper masks, and brightly colored building blocks. The Hang-It-All, which appeared in 1953, was another of the many whimsical pieces produced by the Eameses. They applied what they had learned in developing the rod-welding manufacturing process that they used to produce table bases and their wire chair. Charles and Ray were serious about everything they designed, including the items they designed for children. They believed that adults, as well as children, could learn from the toys they made, and all received the same careful design consideration as the couple's furniture designs. In making their toys, graphics, and films, Charles and Ray made a statement: The appreciation of the small objects that are around us every day is what produces an appreciation of art.